Arrow deals with putting Oliver’s past behind him when Adrian sends one of Robert Queen’s long buried secrets. When I say “long buried” I mean this literally. Receiving a body encased in concrete is a really bizarre thing to receive especially when it has no connection to either Oliver or Adrian. On its own this would be enough of a mystery to fuel the episode but it actually gets dealt with pretty quickly because the overall theme is how Adrian and Oliver –with a bit of Thea thrown in for good measure- relate to their fathers. Adrian’s entire motivation has been to honour the memory of his father through a revenge mission against his killer. Oliver killed his father without a second thought and unwittingly created Prometheus so it is at the centre of this conflict. Adding to this is the fact that Robert Queen made a lot of mistakes that Oliver is trying to atone for. We already know that he was involved in Malcolm Merlyn’s undertaking from way back in season 1 and this episode reveals that he had a really strong argument with a Councilman from the Glades several years ago which ended in his accidental death. There is video footage that clearly shows it was an accident but the fact that Robert covered it up means that the public won’t be sympathetic towards him. Oliver and Adrian are a lot alike in that their underlying motivation is to honour their father’s legacy. The main difference is that Oliver wants to redeem that legacy by righting those wrongs where Adrian simply wants revenge and to tear down the legacy that Oliver is trying to redeem. This almost makes them opposites with Oliver on stronger footing because he has more of a moral code. One thing that stands out is that Oliver isn’t really surprised when it turns out that his father covered up this accidental death. He isn’t prepared to believe that his father is a murderer and his final words about righting his wrongs are so seared into Oliver’s brain that they have defined him. This largely informs Oliver’s belief that his father wasn’t a bad person on a fundamental level so he doesn’t believe that Robert Queen is the kind of man who could murder someone and cover it up. Accidentally killing someone and covering it up is a completely different story and arguably just as bad but Oliver at least believes that his father wasn’t a bad person. A pep talk from Felicity allows him to not throw away his entire motivation as his mission has broadly been a success so the fact that there wasn’t the noblest intentions behind it makes almost no difference. Thea is around to offer some perspective as well. It’s good to see her after a long time off the show and it’s great that there is still a place for her even though she has resigned from working for Oliver. This situation is a very specific one so doesn’t give Thea a long term role in the show that can develop but this shows how important a character she is to the framework of Arrow. She is far less forgiving of Robert Queen than Oliver is and sees her upbringing as the reason she is the way she is. Thea calls herself a “monster” which Oliver completely disagrees with but it’s clear from Willa Holland’s performance that Thea thinks that way about herself and it’s a big part of the reason she gave up wearing a costume and fighting crime. She didn’t like that it was fuelling her darkest impulses and wanted to get as much distance from that as possible. Naturally her darkness is still there and she is fully aware of that just as she is aware of Oliver’s darkness and attributes that to their shared upbringing. It makes sense that she would reach that conclusion as they were both raised by the same people and have a lot of darkness in their lives. This pays off by the end of the episode when Oliver gives her the video that Robert Queen made for her. It’s an important gesture for a couple of reasons. The first is that he wants her to realise that she is her own person who can rise above everything that she has no control over such as her upbringing. She isn’t destined to turn out like any of her parents and once she learns that it’ll be an important step in her overcoming her own darkness. The second is that Oliver is finally done with making decisions for others that they should be able to make themselves. He previously withheld this video because he was worried that it might be a burden for her but Oliver has grown to the point where he is willing to trust others to make decisions for themselves and he puts the choice of what to do about this video message in Thea’s hands where it should have been in the first place. It is a shame that the video is all about Thea supporting Oliver because she is a much deeper character who has so much more to her beyond her relationship to Oliver or anyone else. Adrian comes back in a big way this week and in many ways this feels like a finale; not a very good one but a finale all the same. I’m not saying the episode is bad but it would have been an underwhelming finale especially after such a strong season. Prometheus aka Adrian Chase makes for a great villain because of how insanely detailed his plans are and how well he knows the team. The common thread is that he is always a few steps ahead of Oliver and the rest of Team Arrow so that makes him a very formidable threat. This can create its own problems as sometimes Adrian is too good. It gets to the point where it is more difficult to believe. Creating a cement trap in a skyscraper is a really clear example of a villain being too good. Adrian apparently has infinite resources, perfect knowledge of the team and the uncanny ability to anticipate everything they are going to do. With that kind of advantage it means that his defeat feeling satisfying becomes more difficult. In principle the way Oliver defeats him in this episode works really well. They are basically evenly matched in physical combat because they have had the same teacher so Oliver has to have another kind of victory. He achieves this by telling Adrian an uncomfortable truth thanks to Thea’s ability to question his lawyer. It turns out that Adrian’s father was trying to disown him because of his level of insanity being something he was ashamed of. Adrian had no idea about this and is shocked that the underlying motivation for everything he is doing was a lie. 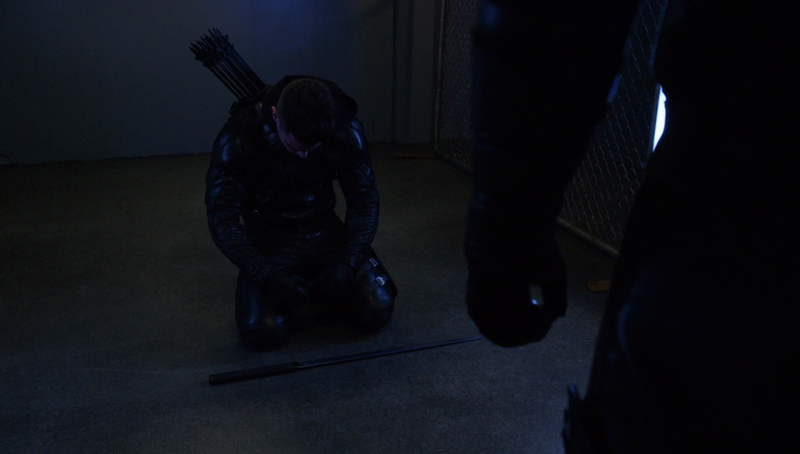 It causes him to give up and essentially beg Oliver to kill him which he flat out refuses to do. Instead he takes pity of him and locks him up in an A.R.G.U.S. cell. Having their conflict end this way is dramatically very satisfying because it lets Oliver truly beat him. He finds a weakness that Adrian wasn’t aware of and exploits it to render his entire crusade essentially meaningless. It should have been a really powerful moment but it was missing something and the end of the episode reveals why. Seeing him standing in his cell with a satisfied smirk on his face suggests that this was part of his plan all along which robs the moment of a lot of its power. Maybe something even better is coming in the last two episodes. The threat against William is still unresolved so that must be the next stage in Adrian’s plan. This episode also sees Oliver taking on the Green Arrow mantle once again. The decision happens between scenes because Felicity is apparently very persuasive. I was expecting some fanfare and maybe a suiting up montage as Oliver reached the point where he was willing to believe in himself again but instead we get the understated and unsatisfying off screen return to the hood that happens here. The return of Cody Rhodes as Derek Sampson left a lot to be desired as well. He was a less than interesting villain in his last appearance and even less so here. He doesn’t even have a showdown with Oliver to allow the meta gag to reach its full potential. His role in the episode is fairly important in one way though. It highlights a major difference between Oliver and Adrian. Team Arrow manages to beat Sampson and his goons because they’re completely loyal to him, have trained together and are trusted to do the job by Oliver where Sampson and his crew are hired goons who don’t have that same loyalty which means a lack of investment in the task at hand. Oliver does have some advantages and the team is definitely one of them. 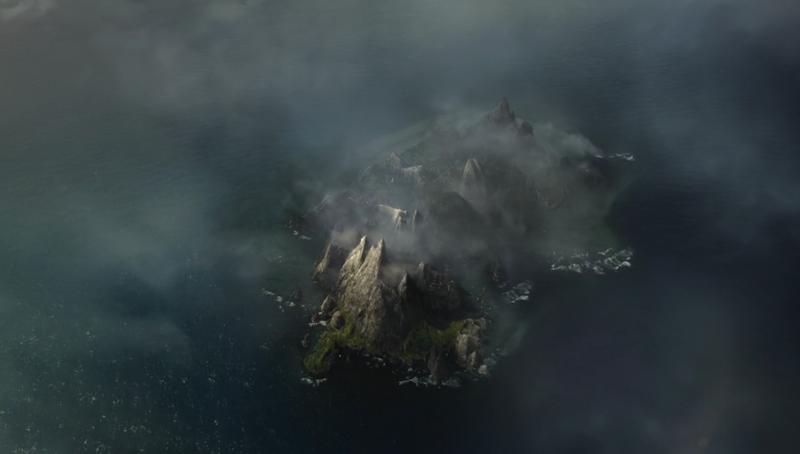 We return to Lian Yu in the flashbacks as Oliver prepares to be found there to begin his cover story that takes him to the start of season 1. It turns out that being found by the fishing boat was no accident since Anatoly arranged for it. We also learn that his overgrown hair and beard was faked. It does answer that particular question about how he could have such long hair despite having no time to grow it but it’s a fairly laughable explanation. 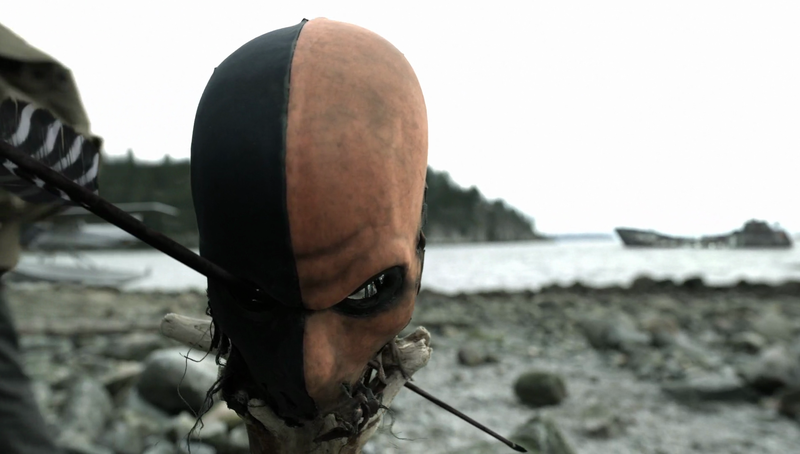 We also see how the Deathstroke mask makes it onto the beach and it’s a somewhat underwhelming explanation. There are some good moments between Oliver and Anatoly that reiterate how foolish Anatoly thinks Oliver is for believing that his darkness can be hidden behind a hood while also showing how strong their friendship was at one point. They talk about being brothers which feels appropriately bittersweet considering how fractured that relationship is now. It looks like Oliver’s last two days on the island won’t be easy since Konstantin Kovar has tracked him down to deliver his own brand of punishment. A solid if flawed episode that deals with the theme of legacy. Oliver is forced to deal with the fact that his father might have been a murderer and has trouble believing it despite all he knows about him. Thea is more open to believing it even after the death he caused was revealed to be accidental. The fact that he covered it up says a lot and the end result to his reputation is largely the same. Oliver is able to hold onto his opinion of his father and continues to be committed to righting his wrongs. Thea finds some closure when Oliver assures her that she isn’t defined by who raised her though it is a shame that video message to Thea from Robert is all about Oliver as she deserves to be her own character. Adrian comes back in a big way but it’s possible that he’s far too good a villain in the sense that he knows too much, has too many resources and his level of preparation borders on the unbelievable. Seeing him smirk in his jail cell backs this up and the cement trap in a skyscraper adds to it. Oliver defeating him by undermining his entire reason for doing what he’s doing is a nice touch but lacks the punch that it really should mostly because it feels like it is all part of the plan. Similarly Oliver becoming the Green Arrow again isn’t as satisfying as it should be. I did like the clear difference between Oliver’s team and Adrian’s team being that Team Arrow are loyal to Oliver and have trained together where Adrian’s team are hired goons who don’t care one way or another. 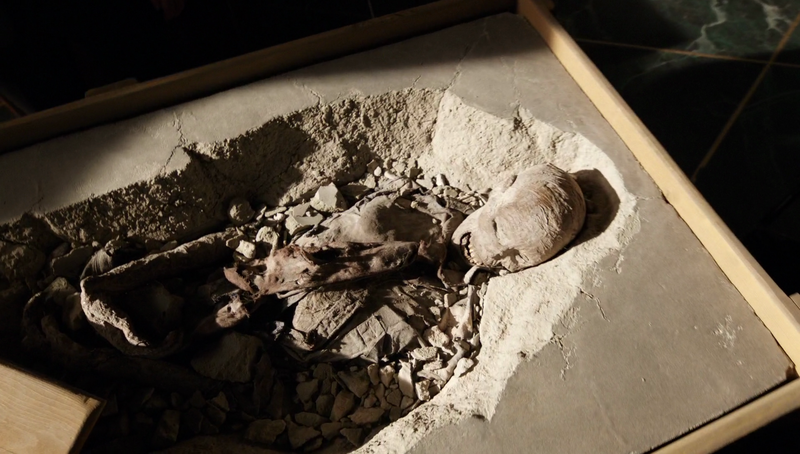 The flashbacks are somewhat underwhelming as the answers they provide to how the Deathstroke mask wound up in the beach and how Oliver grew so much hair in such a short time were underwhelming. The moments between Oliver and Anatoly were well handled though.